Tobacco use is the single most preventable cause of death and disease globally, but tobacco threatens more than people’s health and well-being. It also poses a significant threat to economic well-being and, more broadly, to the sustainable development of countries in the WHO European Region and throughout the world. Strong, comprehensive measures to control tobacco use play a critical role in helping countries to make progress towards achieving the Sustainable Development Goals (SDGs). On World No Tobacco Day, 31 May 2017, WHO calls on countries to prioritize and accelerate tobacco control efforts as part of their responses to the 2030 Agenda for Sustainable Development. 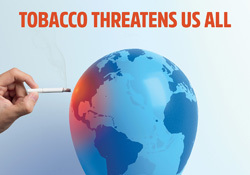 All countries benefit from successfully controlling the tobacco epidemic by protecting their citizens from the harms of tobacco use and reducing its economic toll on national economies. The aim of the Agenda for Sustainable Development and its 17 global goals is to ensure that “no one is left behind”. Tobacco control is viewed as one of the most effective means to help achieve SDG target 3.4: a one-third reduction globally, by 2030, of premature deaths from noncommunicable diseases (NCDs). Target 3.A specifically commits countries to strengthening the implementation of the WHO Framework Convention on Tobacco Control (FCTC), a legally binding treaty ratified by 180 countries, as part of this overarching goal. The inclusion of tobacco control and implementation of the WHO FCTC as a key target of the SDGs recognizes the magnitude of the smoking epidemic. It also indicates the priority that all countries should attach to tobacco control, the need to ensure evidence-based action on the basis of WHO FCTC recommendations, and the reality that Goal 3 cannot be implemented without a strong commitment to tobacco control. The paper “Tobacco control and the Sustainable Development Goals” expands on the links between tobacco use, tobacco control measures and these specific goals. An abridged version of the SimSmoke tobacco control model, developed at Georgetown University, United States of America, has been used to project the reductions in smoking prevalence and smoking-attributable deaths resulting from implementing tobacco control policies. A set of new fact sheets from WHO/Europe summarizes these projections for south-eastern European countries and newly independent states in the Region, and provides detailed projections for each individual country. The findings show, for example, that by adopting a stronger set of policies consistent with the WHO FCTC, smoking prevalence can be reduced by at least 23% within 5 years, at least 30% within 15 years and at least 35% within 40 years in all south-eastern European countries. Likewise, stronger tobacco control policies in the newly independent states could reduce smoking prevalence by at least 28.5% within 5 years, at least 39.1% within 15 years and at least 46% within 40 years. Government commitment to strengthening implementation of the WHO FCTC is a crucial component of action on tobacco control. Yet, while much responsibility rests with governments, there are also vital roles for nongovernmental organizations and civil society. WHO supports countries and civil society in their efforts to combat tobacco industry interference in political processes and to take strong national action on tobacco control. It encourages broader public and partner participation in national, regional and global efforts to develop and implement strategies that prioritize such action.